Begin by seasoning the pork chops with the salt, pepper and garlic. In a large skillet, heat two tablespoons vegetable oil over medium heat and cook the pork as desired on each side. Then 'deglaze' the same pan (create a sauce from the drippings) by adding 1/2 cup beef broth and bring to a boil. Let reduce to 1/3 cup and set aside. In a separate frying pan, fry the plantain slices in a bit of oil until golden-brown. Meanwhile, prepare the salad by combining the grated carrot and tomato slices. Season with salt, pepper and vinaigrette; set aside. To assemble, cover four large plates with banana leaves and place the prepared portions side-by-side: one pork chop with a little salsa for each dish, with a serving of fried plantains to the side, followed by salad, rice, beans, one fried or hard-boiled egg and some slices of queso fresco. Make sure to have plenty of tortillas ready as well. Serve immediately with a good cup of Costa Rican coffee or ice cold cervezas on a hot day. Casado is typically served with black beans, but red or pinto beans can also be used. The white rice can be switched for brown rice if you prefer. This is one of the most original and rico dishes that I know-the secret lies in its simpleness. This classic Costa Rican meal will always leave you incredibly satisfied with its variety of delicious, home-cooked sabores. You could even call it comfort food, with its hearty portions. According to local legend, this dish would typically be eaten by newlyweds. The idea was that a new couple would not yet know eachothers taste in food, so various guisos and salads would be presented together on one dish in order to discover the favorite sabores of each person. 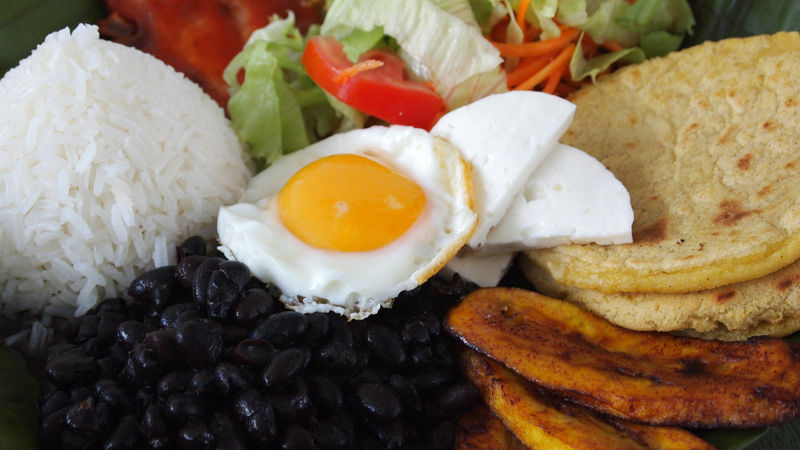 For this reason, many variations of the casado exist, but the essential ingredients are rice and beans; these are not stirred together, but prepared and served separately. The frijoles are simply cooked and served whole, although they are sometimes mashed. The rice used is always white and fine grain. Then meat is added, either beef, chicken, pork or fish. Sometimes the meat is accompanied by carmelized onions or with a salsa, but isn't required. The tortillas are always present as well, large or small, alongside the queso fresco and eggs. A simple salad is the final touch for this meal, either with iceberg lettuce or coleslaw. Between the different options that can be added to this dish, there is a popular Costa Rican stew called picadillo made from potatoes, chayote (pear squash) and green beans cooked in a bit of tomato sauce. Leftover casseroles from the day before also work well. Some even add a few slices of avocado for extra flavor or some pickled vegetables for a tangy touch. In the 'sodas' or Costa Rican restaurants, the casado is served in a square metal dish–not over a normal plate–and covered with a banana leaf for a rustic, homemade touch that makes this meal a pleasure to eat. In your own home, try serving in wooden dishes to capture this beautiful presentation.